Kelp forests populate continental shelves in temperate and polar climate zones. They provide livelihood for a large number of animal species. Kelp forests are already under pressure from human impact like marine pollution, direct harvest or overfishing. Overfishing is particularly detrimental since it increases the abundance of sea urchins which are important consumers of kelp. A prevalence of such consumers may result in urchin barrens. While such places still may become repopulated by kelp plants, subsequent colonization by algal turf is impeding regrowth by and large. 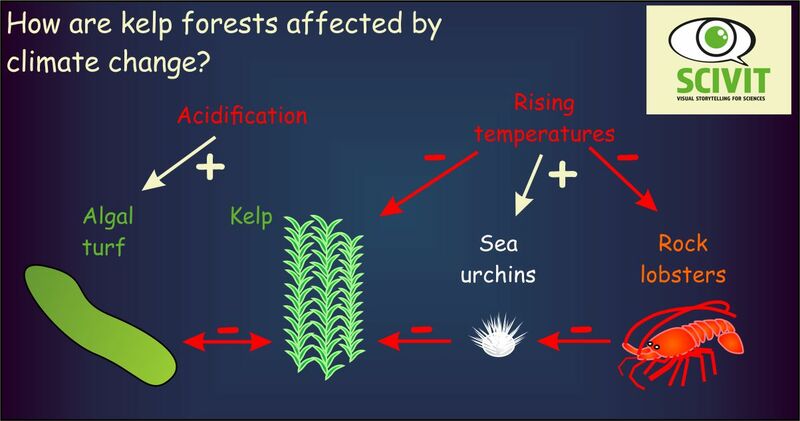 How are climate change effects (acidification and warming) affecting these interactions? Provost and colleagues addressed this question using mesocosm experiments for a Kelp forest from the australian east coast. Experiments addressed ecological effects at the northernmost distribution of kelp forests in Australia, where kelp forests are exposed to relatively high water temperatures. Under these conditions a further rise in temperature had a negative effect on kelp growth, while acidification improved the growth of algal turfs. Temperature also had a positive effect on kelp-eating sea urchins, while negatively affecting rock-lobsters, direct predators of sea urchins. In summary these experiments suggest that kelp forests will be damaged at their low-latitude distribution borders not only by rising temperatures directly, but also by an increasing abundance of consumers and competitors.